For more than two weeks I have kept open in a browser tab essay “How Star Trek Explains the Decline of Liberalism” by Timothy Sandefur. Someone shared the story in one of my social feeds in mid-September—and apologies for not recalling whom. I don’t agree with the title, set against the writing, but I do largely agree with the analysis about Star Trek’s reflection of our society over the course of 50 years. I loved the original series, which aired in 1966. 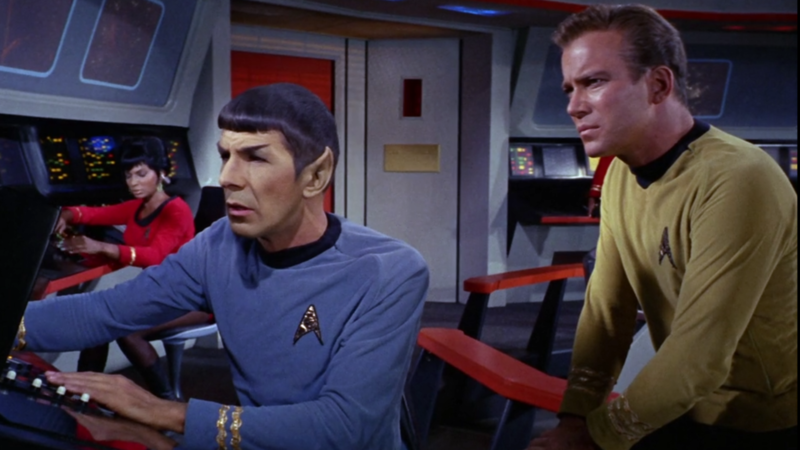 Much as I liked, and even imitated Spock, Kirk’s bravado and moralism rapt my attention. He acted rather than hesitated. Meanwhile, series creator Gene Roddenberry and his producers, directors, and writers used the storytelling as metaphors and allegories commenting on American society and its values. I aspired to be like James Tiberius Kirk: Do the right thing, for the greater good of all, regardless the risk. Next Generation’s Captain Jean-Luc Picard (Patrick Stewart) was more committed to coexistence and non-intervention than to universal liberty and anti-totalitarianism. Following Spock’s lead, Picard would elevate the Prime Directive into a morally obtuse dogma and would seek ways to evade the responsibility of moral judgment. Time and again, the show featured false equivalency on a grand scale, coupled with the hands-off attitude that the Kirk of “The Apple” had dismissed as complicity with evil. Much as I enjoyed the two recent Star Trek films directed by J.J. Abrams, Mr. Sandefur rightly observes, referring to return (again) of the generically-engineered Khan: “The fixed moral stars by which the franchise once steered have been almost entirely obscured. No longer the thoughtful, bold captain, the young Kirk (Chris Pine) is now all rashness and violence”. The author asks, comparing Kirk to Khan, what difference is there that makes one good and the other evil? “Having lost their principles, the show’s heroes cannot really explain, or understand, what differentiates them from their enemies, and so are rendered vulnerable to the very forces they once opposed”, he writes. Over nearly 50 years, Star Trek tracked the devolution of liberalism from the philosophy of the New Frontier into a preference for non-judgmental diversity and reactionary hostility to innovation, and finally into an almost nihilistic collection of divergent urges. Playing off the second pilot that sold the series, I’ll add: Where no values have gone before.